The Kissed Mouth: Happy Birthday Rossetti! Today is Dante Gabriel Rossetti’s one hundred and eighty third birthday. As I’m not sure I can bake a cake big enough for that many candles, instead I offer you my top five favourite Rossetti pictures. 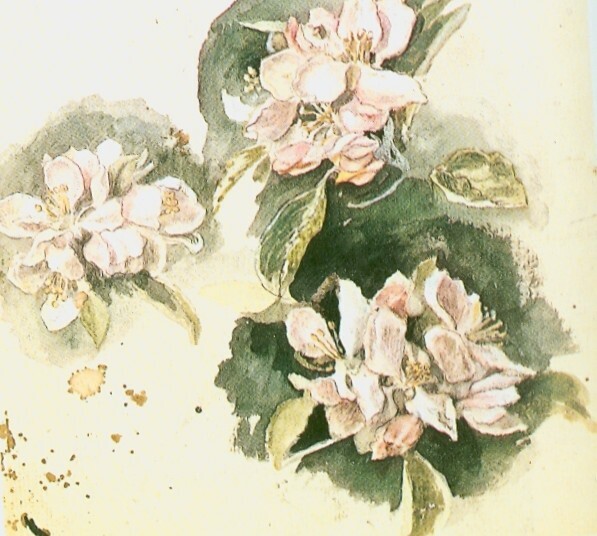 Of all his later oils, I have to admit this has a very special place in my heart, mainly because of the apple blossom surrounding the beautiful figure of Fiammetta. She is framed by the branches and some of the petals tumble onto her as she stands draped in fiery pink-orange and white, echoing the blooms. Above her haloed head flies a blood red bird, a messenger of death and blue butterflies flutter above her right hand, possibly hinting at the departure of her soul. The subject is taken from a sonnet by Boccaccio about the last view of his lover. Like in Venus Verticordia, the short-lived blossom and fleeting butterflies all speak of the transience of life, and her arms follow an almost circular line, as if to emphasis the circle of life (sorry, I’ve gone a bit Lion King). As in Beata Beatrix, the light behind her fades and she has been lit by a glow that is not earthly. The heart charm on her bracelet speaks of an eternal love she will carry with her, but Fiammetta is an angel walking among us, soon to depart. This is one of a pair, the other being May, Jenny’s sister, both of them done in coloured chalks on pale blue/gray paper. I have a weakness for Rossetti’s chalks, I think they rival his oils as being his finest medium, and there is something very touching about this little picture. 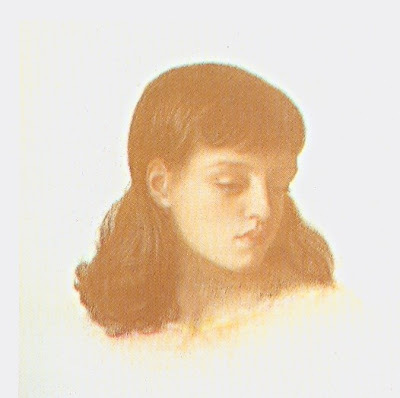 I’m not sure if it’s Jenny’s quiet life or Rossetti’s obvious sadness at never having his own children, but there is a delicate, withdrawn beauty to the image which for me surpasses the pictures of May. There is something reminiscent of Elizabeth Siddal in Jenny’s lowered gaze and her demure engagement with him is captured in the gentle colours. 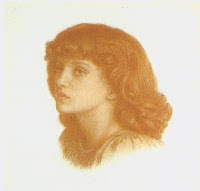 Rossetti’s affection for the girls is evident, and the time he spent with the girls in 1871 can be seen as the last period of stability before the crisis that had been brewing in his psyche finally took hold with the publication of ‘The Fleshly School of Poetry’, feeding the paranoia and guilt that had been dripping through since Elizabeth Siddal’s death and subsequent disturbance. This picture can be seen as the calm before the storm, and for a man that rarely drew children, it is one of his most beautiful portraits. Of his full-scale oils of the 1860s (that aren’t to do with Fanny Cornforth) this has to be my favourite, if only for the fact that there is just so much in it. You have the rare inclusion of a child in a Rossetti oil, five female figures and more jewellery than you can shake a stick at. Also two ethnic minorities, and lilies and rose, not to mention that little swirly hair pin. I don’t know where to start… It harks back to Bocca Baciata with the frame-quote from Song of Solomon, ‘My Beloved is mine and I am his, Let him kiss me with the kisses of his mouth for thy look is better than wine…’ Although the inscription goes on to describe the virgins accompanying this beautiful woman, there is no actual mention of marriage, just the beauty of loving the person you desire. It is suggested that the little African child in the front (formerly a girl then replaced by a boy) is both a foil to the pale, red-headed Beloved, and a reference to the companion in Manet’s Olympia (1863) which Rossetti would have seen on his trip to Paris in 1864. It is an absolute festival of beauty and gives excellent value for money as a party pack of Stunners. 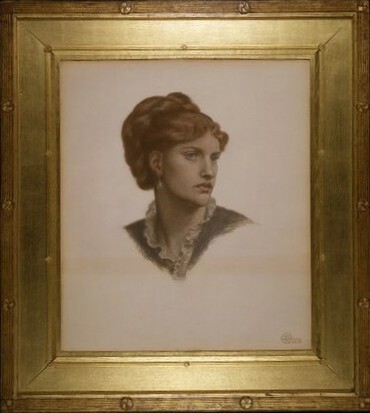 I make no secret that for me Rossetti’s best work starts after he meets Fanny Cornforth. This is entirely my bias and based on nothing but my own personal taste and foolishness. I’m not a fan of his watercolours, which I am justly ashamed of, but that’s the way it is. However, I do adore his pencil sketches and find the wood engravings of them absolutely magical. The Maids of Elfen-mere is my favourite of all of them. There is something both spooky and alluring about the trio of almost identical girls, a motif that would be repeated in later works like Astarte Syriaca, and by other artists such Albert Moore in Midsummer (1887). 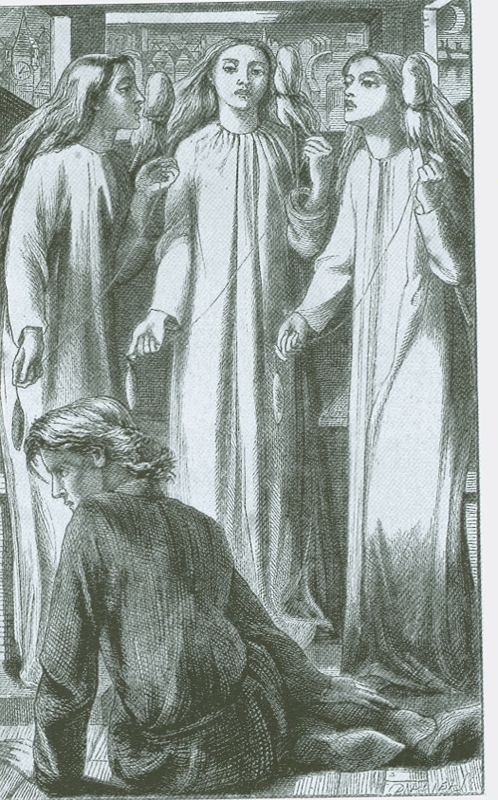 I love the illustration work Rossetti did during the 1850s and early 1860s, and think the work done for the Moxon Tennyson by all of the Brotherhood to be breathtakingly innovative. Even though Rossetti could not see beyond the difficulty caused to him by the Dalziel brothers in their engraving process, in some ways I feel they make his images bolder and more certain in the simplicity of line. 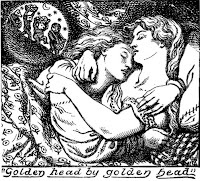 It was a close thing between this image and the work he did for Christina Rossetti’s Goblin Market, equally as astounding, but for the magical appeal of those spooky Maids, I opted for this image. 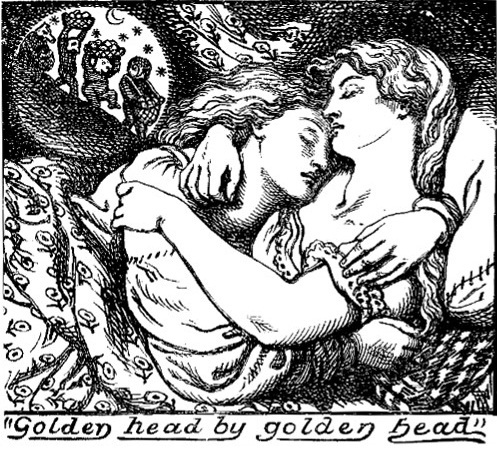 It does seem a shame that Rossetti didn’t do more illustration, it is so beautiful. It was always going to be a Fanny picture at number one, you should know me well enough to see that coming. However, it was a difficult decision, do I go with the opulent magnificence of The Blue Bower (I love that picture and will try and get it on the cover of the reprint of Stunner) or maybe the truth-to-life of Fazio’s Mistress? How about Fair Rosamund? Now, I do love that very much, the blush and the imminent death - Smashing. 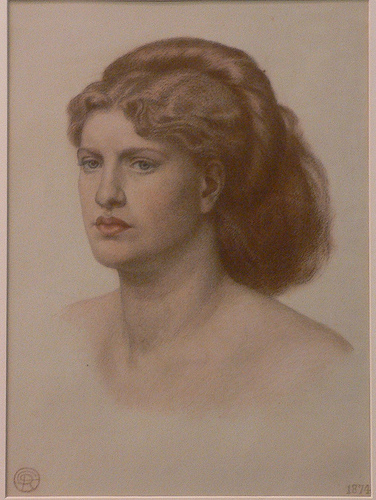 No, as previously covered, I think Rossetti was at his finest in chalk and this, along with the two others completed at the same time, are the most beautiful pictures he ever did of Fanny as they are scarily realistic. Just slightly larger than life, it is uncannily like looking her in the eye when they are on display in Birmingham, and if they were available to buy from their Art-On-Demand site, they would be hanging on my wall. More than the two of her in her white frilly collar and coiled plait of hair, the ‘naked’ picture of her makes her look more vulnerable and real and I like to think Rossetti gives her a slightly defensive look in her eyes, as he returns to her again briefly from his affair with Jane Morris. It is the face of a survivor, not an idealised muse, the face of a woman grimly holding on with all her might and as a Fanny-apologist I see a direct link between her determined expression and my relationship with her as the subject of my research. 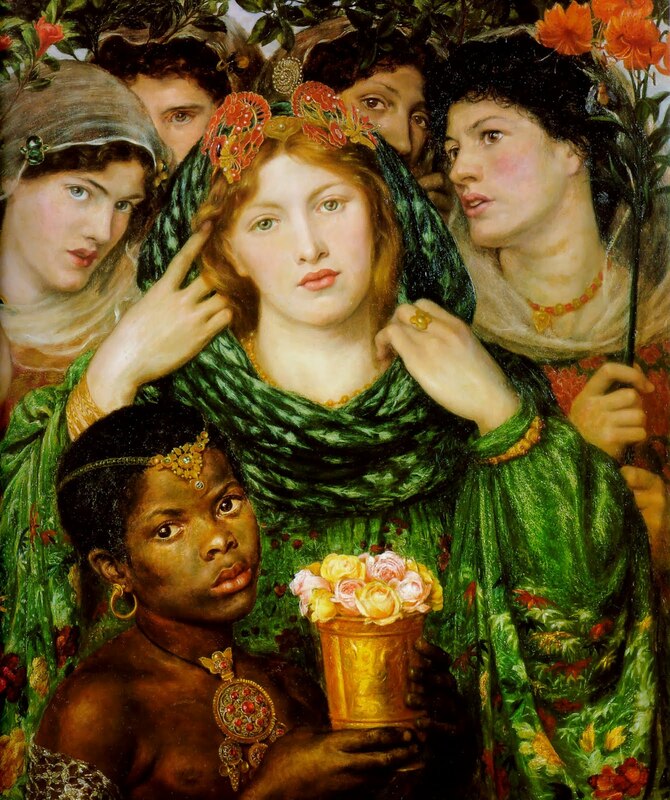 As much as she is my muse, it is through Rossetti that I know her, so I wish Dante Gabriel Rossetti a very happy one hundred and eighty third birthday. My gift to you is my gratitude. Oh, and not giving you the bumps. So glad to see Beloved included in your faves. 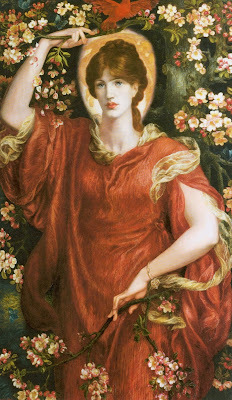 It is my favorite Rossetti of all, I think. Partly because of the colors alone. Those rich greens and reds are just thrilling. Whenever I have the chance to go to the Tate, I'll just stand there gazing at it for at least 20 minutes, if I can get away with it! Now I'm really looking forward to the reprint of "Stunner"! That chalk of Fanny is amazing. I've always liked her the best of Rossetti's models, partly because a friend of mine (sadly now lost touch with) looks tremendously like her, with the long corn-colored wavy hair and the beautifully strong face. I think I had rather a thing for that friend of mine, and I do miss her now. Every time I see one of Rossetti's Fanny pictures, I think of her.